**note: I’m trying to fix the font and other bugs in my new wordpress blog (just made the move this weekend!!). I’ll try to catch up on replying to comments soon! Thanks for making the move with me, and thanks to Kelly for being so supportive!! 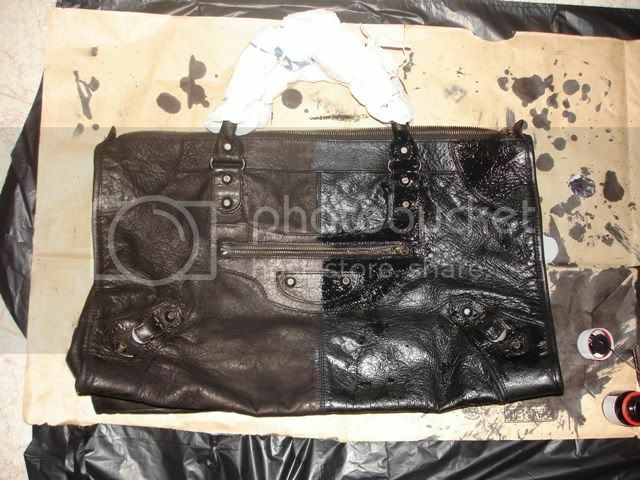 I was browsing my Balenciaga photos, wishing I had the funds for another, when I came across my pics of when I dyed my Work bag last year. It turned out well, so I’m going to share it with you!! I would assume the same process would work for most leather goods. Cut the paper bags and put them on the hard surface you’re going to work on. This will get messy. Clean the leather with the terrago preparer (comes with the dye). Make sure it is as clean as you can get it. You need to get all of that nasty hand oil off of the handle or the dye will not take!! 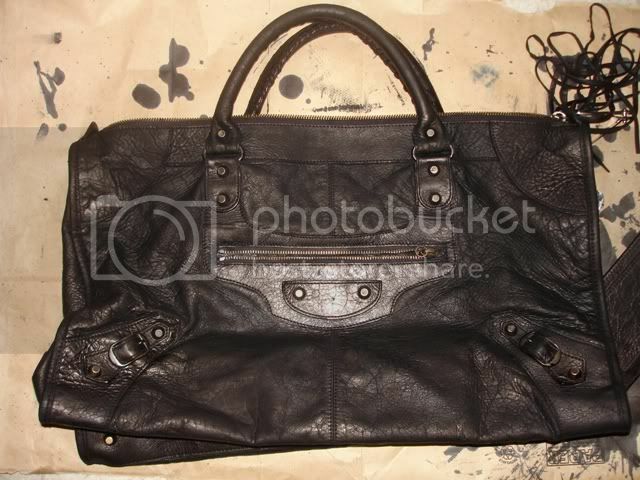 Put on two coats of the Fiebing penetrating leather dye. Allow to dry between coats. Don’t worry if you get some on the hardware. We’ll clean that off later. When the bag is completely dry, put something moderately heavy in it (I used a few small books), and hang it on a doornob. This will stretch the leather out a bit to help prevent it from becoming too stiff. It’ll also insure that your last coat will get in all the small spaces!! After about 24 hours of hanging, you’re ready for the Terrago self-shine dye. Put on a coat and allow to dry. You can put on a second coat if needed. After the bag is completely dry, its time to clean off all of the hardware. Put a little alcohol on the cotton swabs and clean away. It should come right off. 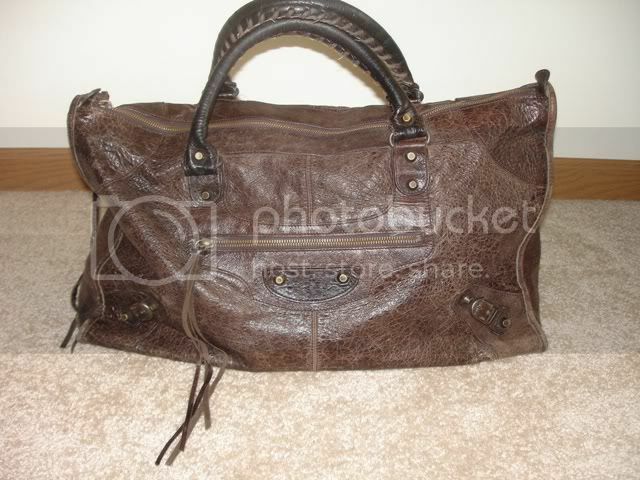 If the bag is a little stiff (mine was), you can roll it a few times and put on a few coats of leather conditioner. The bag will soften up with use!! Hope you had a little fun with this DIY!! that is a really brave DIY! it turned out great! Wow, you are one brave lady! Great job! You are a brave, brave woman! I purchased a rose City once and briefly toyed with the idea of dyeing it but lost the nerve. 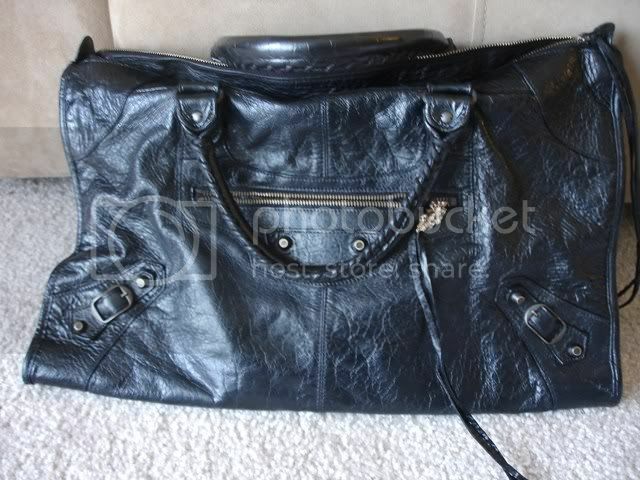 Yours turned out beautifully though and I’m glad that the bag softens with use – I love the smooshiness of Bals. Thanks for sharing! I’ve never thought of dying leather goods before! Wish I learned about this earlier, since I use to have these black leather boots that I adore so much and wore them everywhere until the color faded and I ended up throwing them out. I’ve not found another pair of boots as comfy as those ever since. Man, I wished I had thought about dying it, or trying to dye it, before throwing them out. 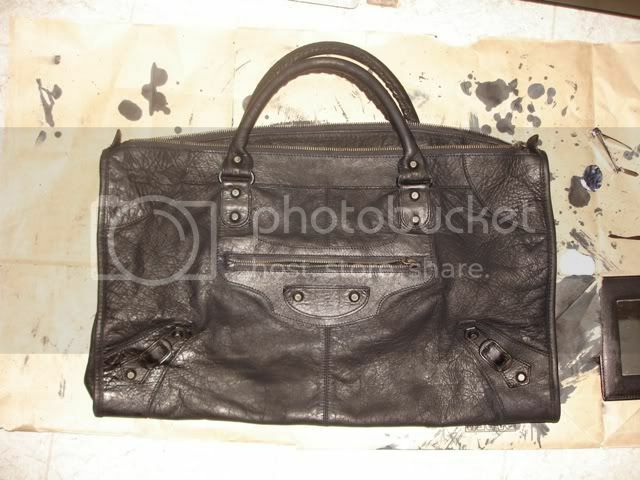 You did an amazing job refurbishing your balanciaga le dix bag! It looks brand new! Thank you for visiting my blog, best of luck as you complete your blog migration. Wow..you’re so brave. You did such an amazing job. I am glad your bag turned out beautifully. Oh my gosh, when I saw this title I panicked. I don’t think I’d have the guts, because knowing me and my luck, I’d screw it up. Looks like you did great! Has the dye held up well? I’ve read some scary stories about dye jobs.